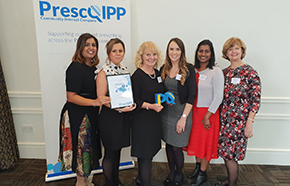 A local NHS project has won national recognition, thanks to work which has stopped nearly 3,000 medicines being given unnecessarily to care home residents. Care home residents are prescribed an average of 7-8 different medicines, which can react with each other, resulting in unpleasant side effects and increasing the likelihood of falls. A fall for an older person can be very frightening, often leading to injury, a hospital admission and loss of independence. saved nearly £400,000 in medicines costs - an average of £200 per resident reviewed. The project was judged the best in its category at the national PrescQIPP* awards. Dr Prag Moodley, CCG Chair and Stevenage GP, said: “It is great to see this collaborative project getting national recognition. Local GPs have been pleased to work alongside the pharmacy team and carers to make sure care home residents’ medicines are necessary and are being used safely to get the most benefit. “The project has improved the health and welfare of local care home residents, for example by reducing medicines that may cause falls and so reducing the numbers of residents potentially requiring a hospital admission. The project has also been supporting care home staff with information about medicines. Reducing the unnecessary medicines taken has also saved money, reaping benefits for the local health economy.